Cook onion and garlic in oil in a wide 4- to 6-quart heavy pot over moderate heat, stirring occasionally, until softened, about 3 minutes. Add rice and cook, stirring constantly, 1 minute. Stir in beets, salt, and pepper(mixture will turn bright pink) and cook, stirring, until heated through. Thin as necessary with some of leftover broth, then stir in cheese and remove from heat. 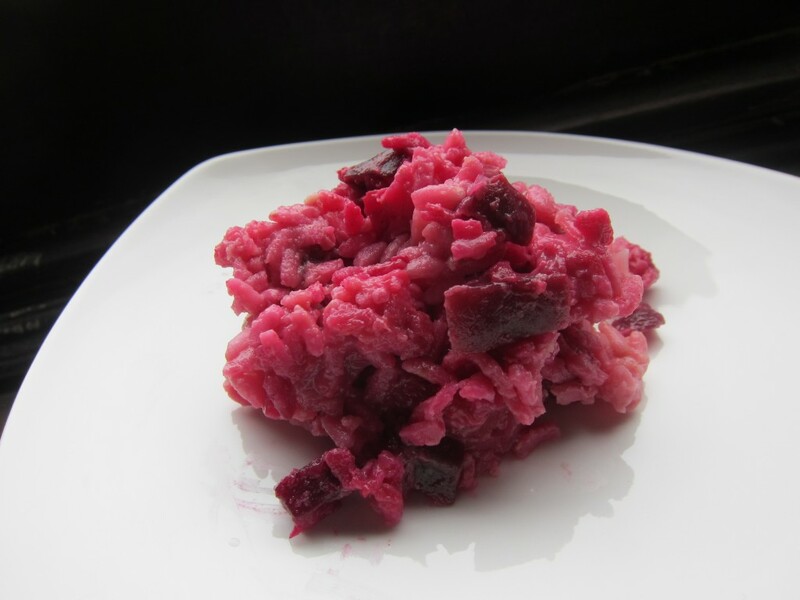 This entry was posted in American, Italian, Recipes and tagged Italian, Risotto, Roasted Beets, Wordless Wednesday by Cheryl. Bookmark the permalink. it sounds really good. I love beets but have never made a risotto. I love beets, too, and this was tasty but I have to say it wasn’t *the most* tasty risotto I’ve had. I think it might be better to save your beets for something where you don’t end up cooking the hell out of them, anyhow! I hear you, I’ll save them for borscht which I crave so much lately! favorite dish from my childhood. the one I could eat every single day for the rest of my life these days. Do you have a favorite recipe? I’ve never made it — would love to try! It funny because in Poland there is as many borscht recipes for it as many households. I don’t have a recipe for mine. I always make it on the spot. Tasting, adding more, tasting, adding more. Each time I make it, it is slightly different as it depends what kind of veggies I have in the fridge. next time I make it I’ll write it down, though. I thought exactly the same when I wrote the comment. my husband likes pretty standard american food so I had to learn how to make it. and when I agak-agak it’s pretty much me who ends up eating the dish. he does not like changes. Do you still go to Singapore to learn new recipes? How funny … I’m fortunate in that the husband very willingly eats anything — even if it turns out terribly! (In fact, he’s more likely to eat my own food than I am.) I still do go to Singapore — heading back in October, in fact. Stay tuned!